Another Year, Another Sea Ice “Recovery”. For the last decade, according to the denial industry, sea ice has been “recovering”. Which is completely correct, if, by “recovering”, you mean there is 75 percent less ice volume than there was 30 years ago. Over the weekend the ever-reliable Daily Mail came up with another masterpiece of boneheaded backwardness. As boring and predictable as this whack-a-mole is, obviously, readers need some handy links when they get the inevitable triumphant “I told you so” from Aunt Teabag and Uncle Dittohead. When it comes to climate science reporting, the Mail on Sunday and Telegraph are only reliable in the sense that you can rely on them to usually get the science wrong. This weekend’s Arctic sea ice articles from David Rose of the Mail and Hayley Dixon at the Telegraphunfortunately fit that pattern. “Around 80% of the ~100 scientists at the Bjerknes [Arctic climate science] conference thought that there would be MORE Arctic sea-ice in 2013, compared to 2012. In short, this year’s higher sea ice extent is merely due to the fact that last year’s minimum extent was record-shattering, and the weather was not as optimal for sea ice loss this summer. However, the long-term trend is one of rapid Arctic sea ice decline, and research has shown this is mostly due to human-caused global warming. Average of NASA GISS, NOAA NCDC, and HadCRUT4 monthly global surface temperature anomalies from January 1970 through November 2012 (green) with linear trends applied to the timeframes Jan ’70 – Oct ’77, Apr ’77 – Dec ’86, Sep ’87 – Nov ’96, Jun ’97 – Dec ’02, and Nov ’02 – Nov ’12. However, the opposite is true of the overall warming of the planet –Earth has accumulated more heat over the past 15 years than during the prior 15 years. Recent research strongly suggests that the main difference between these two periods comes down to ocean heat absorption. 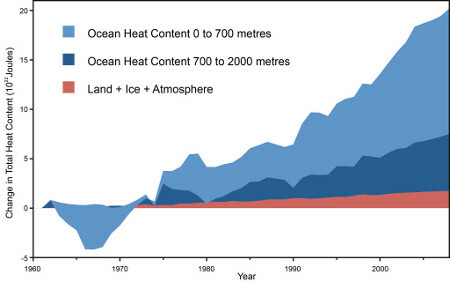 Over the past decade, heat has been transferred more efficiently to the deep oceans, offsetting much of the human-caused warming at the surface. During the previous few decades, the opposite was true, with heat being transferred less efficiently into the oceans, causing more rapid warming at the surface. This is due to ocean cycles, but cycles are cyclical – meaning it’s only a matter of time before another warm cycle occurs, causing accelerating surface warming (as Tsonis’ research shows). Leslie – I didn’t realize the CAGW cause needed yet another anti-social type with little reading ability but there you are. If Antarctic ice were shrinking instead of growing, some explanation would be found, perfectly consistent with AGW if not CAGW. That’s true unless you want to proclaim that shrinking Antarctic ice would invalidate AGW.